If you’re looking for a car lift that is ideal for holding small to large sized vehicles in your shop, iDeal Lift 2 post car lifts are perfect for you. They feature oversized base plates and lifting arms that provide many years of reliable service and excellent performance. Our choices are made of the best materials, and they’re affordable for all shop owners! Our selection of iDeal Lift 2 post lifts features symmetric and asymmetric options, so you can decide on one that fits best in your space. They offer up to 12,000 pounds in capacity, so your employees can feel comfortable working on practically any type of vehicle. They include high-pressure cylinders, a padded overhead bar, a single point safety release, and many other safety and adjustable features to make everything easier to work on. We have a few options to choose from, and they come with different features to help you get the most out of your lift. Depending on the positions you will need to get them in for certain services you offer, could play a major role in your decision. All of our options are easy to use, reliable, durable, and perfect for any type of car shop. 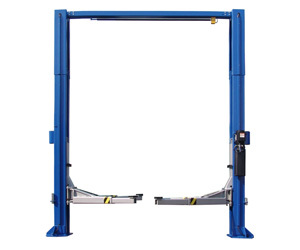 Our iDeal Lift 2 post car lifts also come with available accessories that you can order with the main part. This is necessary for some shops, so we recommend looking into all of our options and features. All iDeal Lift 2 post lifts are ETL/ALI certified, so you know you can depend on them for quality work. You will save time and energy using our iDeal Lift 2 post car lifts, and that can be focused on delivering spectacular service and results for your customers. Our choices are strong, known for being heavy-duty, and they’re all priced at a fantastic value. This is something you will use for many years on a daily basis in your shop, so why not invest in a brand you can trust? iDeal has been a trusted name in the industry for several years and continues to expand their reach in the market. If you have any questions about any of our car lifts, please give us a call.